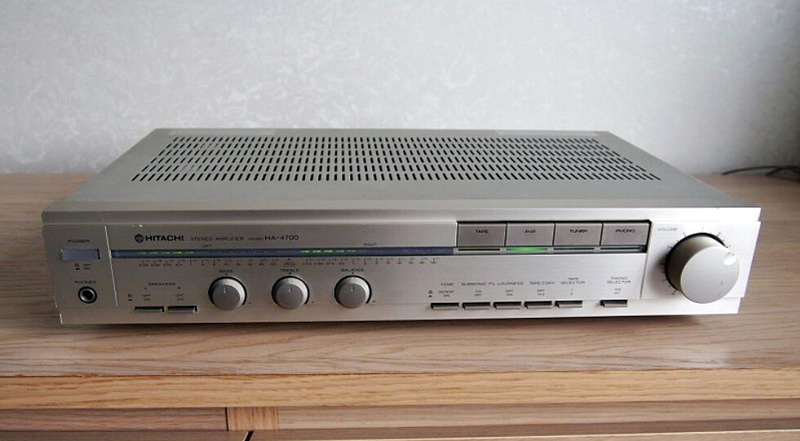 The Hitachi HA-4700 integrated amplifier is rated to deliver 50 watts per channel to 8-ohm loads from 20 to 20,000 Hz with no more than 0.02 per cent total harmonic distortion. It employs a “super-linear” output circuit similar to those used in some other amplifiers to reduce crossover distortion without sacrificing the efficiency of class-AB amplification. The bias on the output transistors is varied dynamically according to the signal level to shift their operating characteristics from class-A at low levels to class-AB at higher outputs. The HA-4700’s phono preamplifier can be switched for use with either moving-magnet (MM) or moving-coil (MC) cartridges. The program source is selected by a row of flat buttons with colored lights below them showing which has been selected. The inputs are identified as phono, aux, tuner, and tape (the last can be operated independently of the others for listening to a tape recorder’s playback regardless of the regular program source).